Published October 12, 2018 at 11:53 a.m. Updated October 12, 2018 at 1:49 p.m.
Youngstown City Schools CEO Krish Mohip will not seek a contract renewal in July 2019. 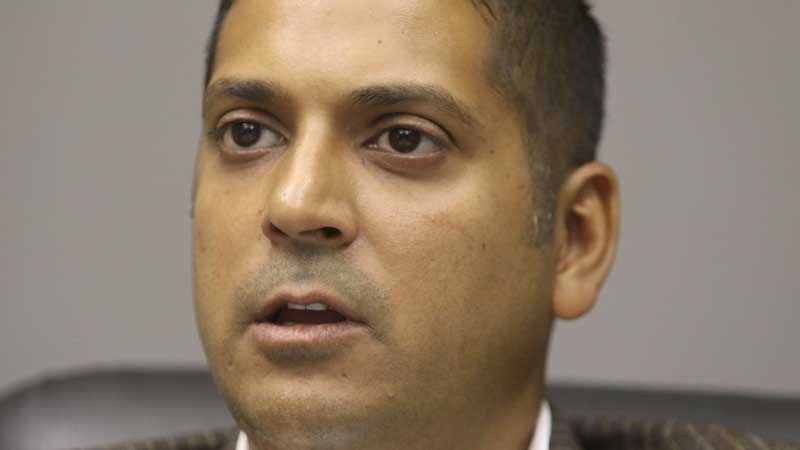 YOUNGSTOWN — Youngstown City Schools CEO Krish Mohip will not seek a contract renewal in July 2019. Mohip said the decision was a difficult one to make because of how much he likes the city but through “soul searching” he decided it was best for him. On Sept. 26 Mohip told The Vindicator he planned to stay on with the district and was hopeful for a contract renewal. He also did not hint of departing last week in an editorial board meeting at East High School. The Youngstown Academic Distress Commission just approved a $6,000 bonus for Mohip Sept. 27, just weeks after the district received an overall F grade on the Ohio Department of Education State Report Card. Reaction to Mohip's announcement is already coming into the newsroom. Youngstown City School Board member Dario Hunter, a longtime Mohip critic, said in a statement it appears the CEO "plans to get out of Dodge before the district hits financial as well as academic rockbottom." "His administration has focused on his personal PR gloss rather than hard-won results achieved by making difficult but necessary collaborative decisions with all stakeholders," Hunter said. "He has never really understood Youngstown and most often refused to understand the city he served when that understanding clashed with his own ill-conceived, untested plans. Youngstown City Schools board president Brenda Kimble said she commends Mohip for stepping down. "We know we will get another CEO and it has to be someone effective in turning the district around," Kimble said. "I think Mohip knows there's nothing more he can do. I commend him for allowing someone else to come in and I wish him luck wherever he's going." Kimble said she could foresee Mohip's departure coming which is why she was upset about his $6,000 bonus coming weeks after the district scores "the lowest F it has ever had" on the state report card. "We cannot deal with false growth anymore with our children," she said. The Ohio Department of Education, which employs Mohip via The Youngstown Academic Distress Commission, has also issued a statement. "We're grateful for Krish Mohip's efforts and the progress that has been made on behalf of Youngstown's students," said Brittany Halpin, ODE spokeswoman. "We appreciate the notice he's provided, which gives the commission and the district time for an orderly transition. We wish him well." October 12, 2018 10:50 p.m.
February 20, 2019 12:09 a.m.
February 20, 2019 9:55 p.m.